BuzzFeed News analyzed all the links Donald Trump tweeted since he launched his presidential campaign to determine where the president-elect gets his news. The sites Trump has tweeted since announcing his campaign in summer 2015 mapped by frequency. Since winning the presidential election, Donald Trump has reportedly skipped out on the majority of his intelligence briefings; this past Sunday, Trump made headlines after sharing false information blaming his loss of the popular vote on mass voter fraud — a claim previously reported by the conspiracy news site Infowars. It’s been widely reported that Trump is an obsessive consumer of cable news — he has himself admitted to receiving at least a portion of his military advice from “the shows.” But, pundits and chyrons aside, relatively little is known about where the next president will find the news and commentary that might color his time in office. What exactly is Trump’s media diet? What we know of Trump’s relationship to the modern internet suggests the president-elect rarely browses it himself. Trump campaign press secretary Hope Hicks told GQ he relies largely on Google News printouts from staffers and sparingly reads his own email. And a 2007 deposition suggests that Trump doesn’t use a computer or carry a smartphone during the daytime hours, and often dictates daytime tweets to his assistants. To better understand Trump’s media consumption, BuzzFeed News turned to the president-elect's largest source of public proclamations and shared news: Twitter. While Trump’s media consumption and methods appear opaque and unconventional, the stories he chooses to share with his now 16 million–plus followers offer a unique window into the news and commentary that catch his eye. BuzzFeed News reviewed 26,234 of Trump’s 34,062 tweets, which we received through the Twitter API and developer Brendan Brown, who has archived Trump’s tweets beyond what is accessible via the API (a stream of data that includes information like tweet text, time, and date). We filtered that data down to the 2,687 hyperlinks tweeted by Trump’s personal Twitter account since he announced his candidacy in June 2015. By programmatically expanding the shortened links in his tweets we were able to group and count them to generate a rudimentary portrait of the news and opinion he publicizes and, presumably, consumes. A few things to note before the data: The analyzed tweets were broadcast between June 1, 2015 — the month Donald Trump announced his presidential campaign — and Nov. 17, 2016. The majority of Twitter.com links tweeted by Trump's account were retweets. Sites that were categorized as "media" were broadly defined as organizations that publish content regularly. Campaign-related links include links to President-elect Trump's own website as well as links to sites related to the GOP. Our analysis revealed a media ecosystem that appears to largely reinforce and affirm the views publicly expressed by Trump and his closest advisers. The news stories Trump tweets share several characteristics: 1) They often favor sensationalism over facts and reporting; 2) They frequently echo direct quotes from Trump himself or his closest advisers; and 3) They routinely malign his enemies and vindicate his most controversial opinions. When it comes to news sources, the stories tweeted by Trump (and the staffers who sometimes manage his Twitter account) suggest that he is unfazed by news of questionable accuracy, likely to rely on hyper-partisan news, and apt to promote mainstream news only when it validates his opinions. While politicians from both sides of the aisle use their Twitter accounts to share content that furthers their agendas, Trump's reliance on sources and stories of questionable accuracy stands out both in frequency and in engagement. The stories shared by Trump’s account throughout his campaign suggest the president-elect has constructed a powerful online filter bubble that largely flatters and confirms that which he claims to be true. Using his tweeted links as a guide, Trump’s favorite information source appears to be Twitter itself. Nearly half of the hyperlinks shared by Trump’s account during his presidential campaign come from Twitter URLs. Many show Trump retweeting his fans, including — according to Fortune — at least 75 retweets of white supremacists and a false claim about gun violence demographics. Trump’s other most frequently tweeted links are to his Facebook page (266 links) and his website (201 links — most referring to statements, event schedules, and voter information). Trump rarely shares the kind of flagrantly concocted fake news stories promoted by Macedonian teens. Yet the president-elect does seem to have an affinity for factually murky stories bolstered by opinion, circumstantial evidence, and hearsay that appear generally supportive of his most controversial statements. Frequently throughout the presidential campaign Trump tweeted stories that seemed to back up his claims that “thousands” of Muslims cheered from New Jersey rooftops as the World Trade Center towers fell on 9/11, despite no evidence from police or confirmed news reports. Other Trump-tweeted stories include a Breitbart piece with the headline, "Trump 100% Vindicated: CBS Reports ‘Swarm’ On Rooftops Celebrating 9/11" and a New York Post piece about Orlando Pulse nightclub shooter Omar Mateen allegedly celebrating on 9/11. These stories prove slippery in their presentation by Trump or in their framing of the facts they claim to report. The Post headline, despite Trump’s insistence, does little to bolster his claim — Mateen was a teen in school in Florida and not in New Jersey, where Trump claimed the cheering took place. And while the Breitbart headline suggests “swarms” of cheering Muslims, the video evidence — in the form of a Sept. 16, 2001, local newscast — shows only anecdotal evidence of cheering (framed as such by the newscasters). The reference to a “swarm” overstates the anecdote which notes that a group of eight individuals possibly of Muslim faith were arrested in New Jersey after 9/11. Like a number of the stories Trump shares via Twitter, strong headlines and flimsy evidence are touted as vindication of a controversial claim, but leave the vigilant reader with the daunting task of proving a negative. BuzzFeed News’ analysis shows that, despite Trump's repeated claims of a deeply biased mainstream media, the president-elect shares news stories from a high number of traditional media outlets. Throughout the course of the campaign, Trump frequently tweeted from mainstream organizations like the Washington Post (26), New York Post (22), The Hill (21), Politico (15), CNN (12), USA Today (10), Bloomberg (7), Forbes (7), CBS News (6), ABC News (5), and NBC News (5) among others. In nearly every instance, the stories shared were news items about polls that favored Trump (many from the primaries) or negative articles about Hillary Clinton — many of them aggregations of WikiLeaks emails. It’s worth noting that BuzzFeed News’ analysis of Trump’s shared links suggests that when the president-elect does tweet a report from a mainstream publication, it is often to share positive news about himself or a report that supports his positions. Trump, for example, was quick to share a Slate story touting polling data on his own leadership qualities — he shared the story twice in two days — adding an “I agree!” endorsement. But beyond one other nonscientific online poll, Trump did not share any of the more than 4,400 Slate stories containing his name — many of them adversarial in their coverage — published on the site within the past year. Analysis of the links Trump shares on Twitter charts a media echo chamber that is often literal. Stories shared by the president-elect were frequently sympathetic recaps of his campaign rallies, composed mostly of quotes from Trump himself containing unsupported claims. Of the 2,687 links Trump tweeted since beginning his campaign, the story with the highest number of combined likes and retweets (53,700) comes from LifeZette, a politics site whose editor-in-chief is pro-Trump political commentator Laura Ingraham (and who is reportedly on Trump’s short list for White House press secretary). The story’s only quotes come from the stump speech in which Trump first pledged to “drain the swamp” in Washington. Similarly, links tweeted by Trump’s account highlight praise from those in Trump’s inner circle. In one tweet from July, Trump shared a CNBC op-ed suggesting that America “need[s] a tough negotiator like Trump to fix US trade policy,” a post authored in part by Trump policy adviser Peter Navarro. BuzzFeed News’ analysis of Trump’s media universe shows the president-elect isn’t immune from sharing more blatant misinformation. Throughout the campaign Trump’s Twitter account shared two separate stories from prntly.com, a site that used to sell business cards and postcards and now calls itself “America’s Top News Site.” Prntly has been described by the Washington Post as “fake news” and is run by a former ecstasy dealer from Albany. According to the Post, Prntly has allegedly made up its own sources, lifted copy from other sites and pawned it off as “exclusive,” and allows users to sign up and write their own news stories without any vetting. "@DanSaltsman: @realDonaldTrump @Ford @crainsdetroit @detnews @CNBC https://t.co/k2JFVTDDbW Do you think Hillary, Ben or Jeb could do this? The two Prntly stories Trump has shared — both since removed from the site — include claims that Trump’s appeal with Rust Belt voters is higher than any candidate since FDR (no citation or evidence) and that Trump successfully pressured Ford to move a Mexican plant to Ohio (incorrect and disproven by numerous outlets including the Washington Post). Similarly, Trump has shared news articles from hyper-partisan and frequently nonfactual blogs like Powdered Wig Society, which, recently lamented, “WaPo put out a list of fake news sites and Powdered Wig is not included. Dammit! We shall endeavor to try harder.” The blog post shared by Trump cites Prntly as its source and refers to Hillary Clinton as “Hitlery” Clinton. Frequently, stories shared by Trump from hyper-partisan outlets sacrifice facts for convenience of narrative. 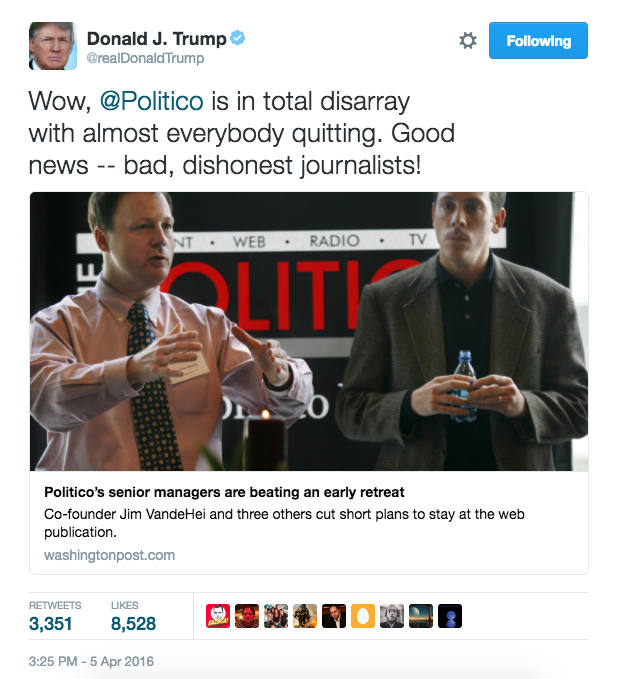 One Gateway Pundit piece retweeted by Trump this past August alleged that a “Democrat Fire Marshal Turn[ed] THOUSANDS of Trump Supporters Away at Columbus Rally.” The tweet helped to stir up a micro-controversy among Trump supporters of unfair bias and toward the Republican candidate. A follow-up article from the Columbus Dispatch corrected the number, reporting only a few hundred were turned away and that convention center officials capped the rally at 1,000 — a number the Trump campaign agreed to beforehand. Trump’s Twitter account is just one part of the president-elect’s information diet, but it’s an instructive one. 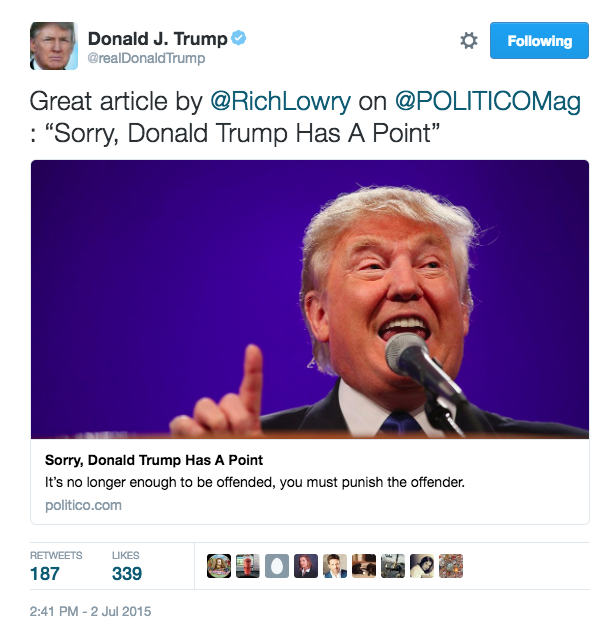 With its broad reach comes considerable influence; a BuzzFeed News analysis found that Trump’s average news tweet receives about 10,265 engagements (a combination of retweets and favorites) with a median engagement of 4,729, while his top news tweets garnered well above 53,000 total engagements. Throughout the campaign, Trump's engagement from his account outperformed Hillary Clinton's substantially. In the three months leading up the election day (Aug. 9 to Nov. 8), Clinton's account tweeted 2,449 times with an average of 3,964 retweets; Trump tweeted 587 times with an average of 10,863 retweets. And many of Trump's biggest non-news tweets pulled in hundreds of thousands of total engagements. Thanks to Trump’s facility with Twitter and his uncanny ability to use it to simultaneously bypass and program traditional media, the account has been a uniquely powerful megaphone for his candidacy — and an unconventional preface for his presidency to come. This story was amended to remove the Daily Caller's inclusion in a list of "hyper-partisan sites and opinion blogs."